The Hi-Tec Rotorua Ekiden Relay will be run around the roads encircling beautiful Lake Rotorua. An internationally recognised event, the Ekiden relay is run over the marathon distance of 42.2km and consists of teams of six competitors who wear a traditional Japanese tasuki sash instead of carrying a baton. 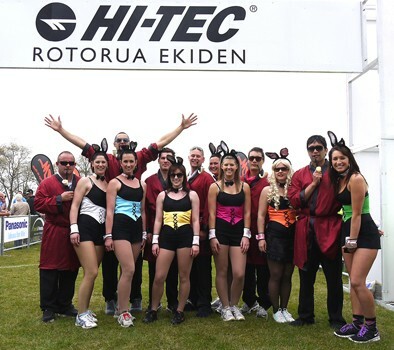 Clubs, companies/businesses, social groups or schools can enter teams for the 10th Hi-Tec Rotorua Ekiden Relay.The shortest leg of the relay is 5km and the longest 10km. Join the other 2000+ participants in New Zealand's favourite relay. All participants receive a Hi-Tec Ekiden T-Shirt valued at $45.00 + a bag of sponsors products a the chance to win fantastic spot prizes.